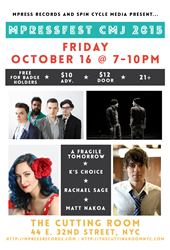 Featuring multi-platinum artists K's Choice for their only NYC-area performance, A Fragile Tomorrow's CD release show, Rachael Sage and Matt Nakoa on Friday, October 16, 2015 - 7pm at The Cutting Room NYC. MPress Records is proud to bring back its popular CMJ Music Marathon showcase, MPressFest CMJ. MPress will present the 7th installment at The Cutting Room (44 E. 32nd Street, NYC) on Friday, October 16th at 7:00pm. MPressFest CMJ 2015 will showcase an exceptional line-up of talent including the label's two newest signings K's Choice and A Fragile Tomorrow (for their joint NYC CD release shows), Matt Nakoa, and Rachael Sage. CMJ badge holders get in free, but must RSVP. Open to the public, tickets are available now, $10 adv. and $12 at the door. Charleston, SC four-piece A Fragile Tomorrow celebrate the release day of their MPress debut "Make Me Over" on October 16th. "Make Me Over" is saturated with the transformative air of rock n' roll androgyny, inhabiting songs that are complex yet immediately infectious. Their performances are thick and swirling with dense layers of multiple guitars and heady vocal harmonizing. Belgian brother/sister duo K's Choice will also be celebrating their new album "The Phantom Cowboy", out on September 18th. Sarah and Gert Bettens deliver the most honest, gritty, straight-ahead rock album of their career and have prepared a captivating acoustic show for their only NYC-area show this year. MPress Records' Official CMJ Showcase takes place at The Cutting Room (44 E 32nd St., NYC) on Friday, October 16th at 7pm during CMJ Music Marathon week. CMJ badge holders get in free but must RSVP. Tickets are on sale now for $10 adv. ($12 door), 21+.